Today I'm getting started on beer based on an unusual historical style, a Lichtenhainer. What makes this style unusual is it's both a smoked beer and a sour beer, along the lines of a smoked Berliner Weisse. I'm a huge fan of both smoked and sour beers, but I have to admit that a sour smoked beer sounds a little weird even to me. Regardless, I'm doing one. At one point all beers had a smokey character due to the way that malt was produced; malt wasn't originally isolated from the fuel (wood) that was used for drying and kilning. For my interpretation of the style, I smoked all the malt using my malt smoking setup. For this version, I decided to use pecan wood for smoking and I'll be doing a kettle sour method. So this beer is more along the lines of being inspired by the historical style rather than being a true example of the style. The recipe I'm using is based on Mark Schoppe's award-winning NHC recipes. My interpretation is likely to turn out more sour and more smokey than Mark's. I'll be doing a split batch (after primary) where half will get chipotle peppers added in secondary. As with other smoked beers, it's extremely important to eliminate chlorine from your brew water. If you don't, you're almost guaranteed to have chlorophenol problems. Here's the recipe as I'm making it today. Mash at 150F, transfer to boil kettle and raise temps to 175F for 15 minutes to pasteurize. Chill to 100F before pitching GoodBelly and sour to a target pH of 3.4-ish. After target pH is reached, proceed with boil, 90 minutes. Ferment at 63F. When primary is complete, add 1 rehydrated chipotle pepper per gallon. Day 1 - Things went fairly smooth with no issues. I ended up using phosphoric acid to reduce the pH to about 4.48 before pitching the lactobacillus. I haven't really done that before, but it's pretty standard for kettle souring. I sampled the wort and the smoke level seems complimentary and not overpowering. That's a good sign because it can tend to come out more after fermentation and carbonation. Day 2 - I proceeded with the boil today (5/28), no issues. The post-boil pH came in at 3.37. OG is 12.2P (1.048). Half got kegged today, and the other half went on three chipotle peppers (two large, one small), rehydrated in boiling RO water. I bottled the Chipotle half today. I tried the straight half and it had a horrible green apple cider character. I may have rushed it through primary, meaning the yeast didn't have time to clean up acetaldehyde from primary fermentation. I didn't notice the issue in the Chipotle half... possibly because of the extended aging on the peppers. Another possible problem, I cold crashed this batch then raised the temp back up because of another beer I had in the ferm chamber. Then I cold crashed again. This may have exposed it to too much oxygen. I ended up dumping the straight half; it was nothing I'd ever want to drink. One of my nephews is a chef and used to work at Haven Gastropub in Orange, CA. While there, he came up with a recipe for pork belly that was absolutely amazing. He described a process called sous vide, where they would cook the pork belly overnight in a water bath. Then before serving, the pork belly would be briefly seared in a hot pan, just enough to add some a thin layer of bacon-like crispness to the pork belly. It was served on a bed of greens and the low and slow cooking process resulted in a delicious fork tender dish that practically melted in your mouth. 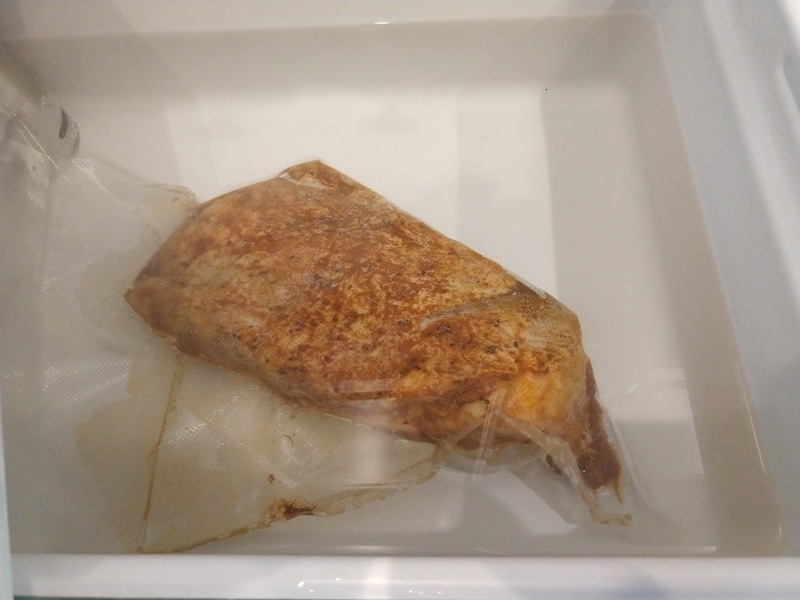 Sous vide cooking is pretty well known now, but when I first tried my nephew's dish, it was a process I'd never heard of. I looked into it a bit and saw that there were several sous vide cookers on the market but I was hesitant to lay out the cash for one. They're pretty basic and usually consist of a heating element controlled by an electronic thermostat/switch that receives a signal from a temp probe. There's also some means for circulating water to ensure even temperatures throughout the water bath. It doesn't take a genius to realize this is very similar to my HERMS setup and how I use it for mashing grain. 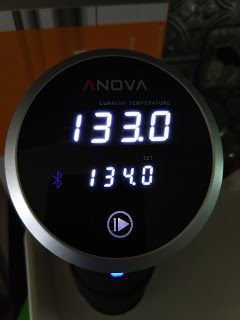 So I decided to do a trial sous vide cook using my brew system and some beef tenderloin steaks. The results were amazing and not too long after that, I bought an Anova Precision Cooker. Now you may ask, why did I buy one when my brew system worked so well? Well the brew system was a bit of overkill for what's needed (too much water, too much cleanup, etc.) 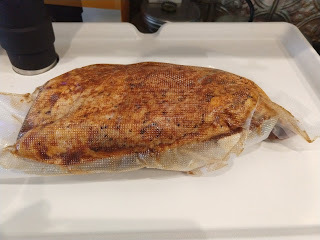 and sometimes certain spices can permeate the plastic bags used for sous vide. I definitely didn't want any beefy off flavors in my beers, so I decided to buy a dedicated unit. The process is pretty simple so I won't go into a ton of detail. Plus there is a lot of info on the Internet, so there's no need to regurgitate what's already out there. Basically, you season your food, seal it in a bag, then cook it in the bag in a water bath at a given temp for a given period of time. This usually means low temps and several hours cooking time. 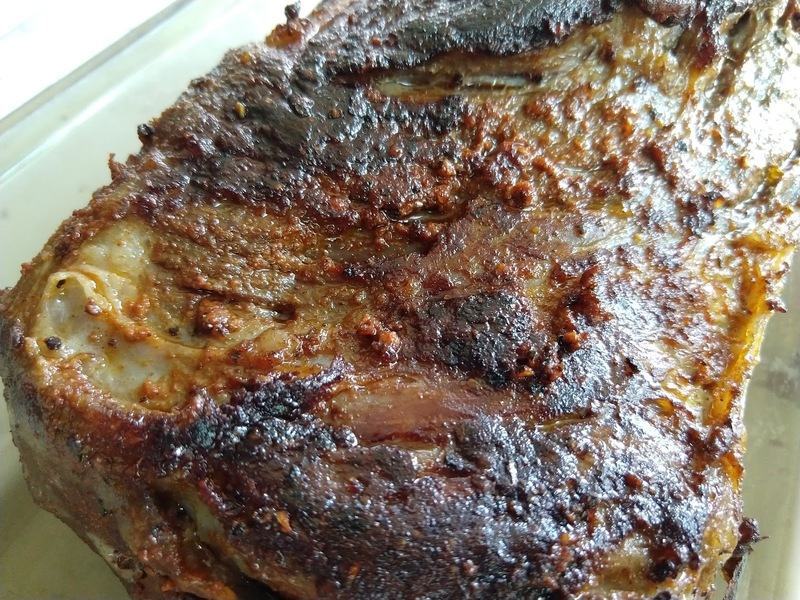 The end result is very flavorful, juicy, tender meat (although it's not just for meat). Additionally, because of the low and slow method and the precise temp control, you end up with perfectly cooked meat all the all through (medium rare at our house for beef). That's right, no tough, chewy, dry over-cooked meat. As for equipment, I use a food sealer, but there are ways to do it with regular zip lock bags. For the container, I use a Coleman Party Stacker cooler and cut a hole in the lid so I can insert the Anova. Then it's just a matter of filling the cooler with the appropriate amount of water, bringing it up to temp, then adding your bagged food and setting the timer. It's worth mentioning, after the cook you still want to usually sear your meat. I use a hot cast iron pan on my grill for this. This gives you the flavors associated with grilled meats (maillard reactions) and without it, it's closer to boiled meat. So like my brewing and other food related posts, I post this kind of stuff do that I make sure I do it The same way each time. It also helps if I decide I want to tweak things. So today I'm doing a tri tip with Santa Maria seasoning. I recently discovered a butcher shop near my house (Don's Meats) and I've been buying my tri tip there. The butcher is awesome and the meats have been great, plus it's always nice to support local businesses. Tri tip is great as a main dish, but we also like to slice it thin for sandwiches which is what we'll be doing with this one. As described above, I sealed the tri tip in a vacuum seal bag then cooked it in my sous vide setup at 134F for 3 hours. Minimum time for this is about 2 hours and maximum is about 6 hours. I've heard too long in the water bath can change the texture for the worse, so I'd recommend shooting for something between 2 and 4 hours. It was then removed and seared on each side for about 1 min per side (flipped every 30 seconds). That's about all there is to it...eat it or chill out to be sliced later.